Measure I is about whether to allow San Diego High to remain in Balboa Park, forcing voters to choose between education and recreation. But there could be another choice. In November, San Diego voters will decide the future of San Diego High School. They’ll vote on whether the school can continue in its present location in Balboa Park or be forced to relocate by 2024, as required by the 1974 lease between the city and the San Diego Unified School District. The City Council has placed a proposed amendment to the city charter on the November 2016 ballot that would allow San Diego High to remain in Balboa Park. The proposition, called Measure I, asks voters to choose between education and recreation. But there could be another choice. Rather than framing the issue as a high school that’s occupying public park land, why not think of it as a school that has the potential to grow the park for the public? In order to rethink the role of San Diego High School, one needs to think about the future of the nearby East Village neighborhood. Both the Idea District and Makers Quarter projects are being celebrated nationally for their plan to reimagine East Village as a technology hub. San Diego High School and City College fit well into the vision for East Village. The city could keep the high school where it is, make some tweaks and create a “school in the park” scenario that aids the neighborhood’s transformation into an innovation hub. • Open the athletic fields at San Diego High School and City College for public use when school is not in session. The city and the school district have similar joint-use agreements at many of the district’s schools. • Restore the high school’s Balboa Stadium so it can serve a broader range of events, both school- and park-related. • Replace the asphalt parking lots around Balboa Stadium with turf and investigate the potential of structured parking on nearby Inspiration Point as a joint-use park and school garage. • San Diego High is cut off from the rest of Balboa Park by Interstate 5. Reconnect the school site to the rest of the park and to downtown by extending a connection from C Street across the freeway and through the park. Also, extend the 14th Street Promenade, a proposed city project that would connect East Village to Barrio Logan, through City College around Balboa Stadium and across a new bridge to Balboa Park. • Further reconnect the school site to the rest of Balboa Park by implementing the city’s plan for Inspiration Point. Inspiration Point is the parking lot near the corner of Park Boulevard and President’s Way. A number of years ago, the City Council developed a plan for this area of the park, but then never acted on it. The plan called for a parking garage topped by a park deck. • Expand the role of San Diego High School to better fit the development of East Village as an innovation district. San Diego High is composed of a school of business and leadership, a school of international studies and a school of science and technology. Why not add a school for innovation? 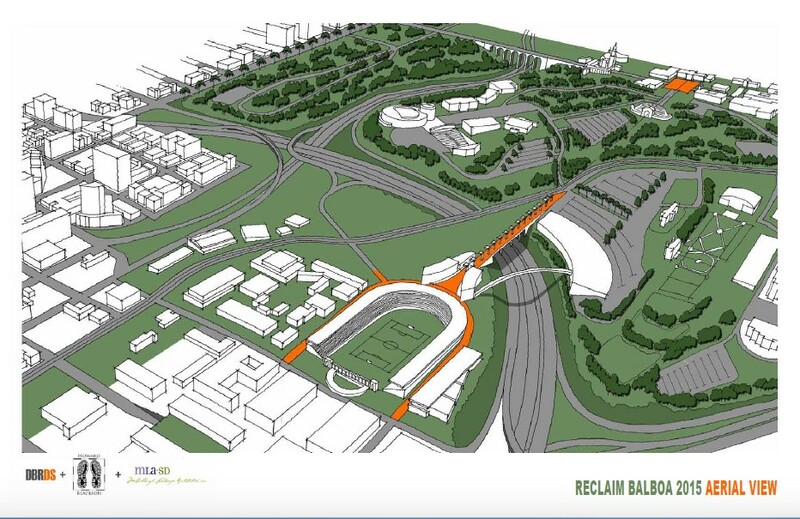 • More recently, a group of design professionals that call themselves Heal the Gash have been working on how to implement the capping of Interstate 5 to reconnect neighborhoods and grow the park. The proposed decks over the freeway have the potential to include new parking that could serve the school, the park and downtown. None of these ideas is inexpensive, but moving the school and restoring the land for park purposes will be extremely expensive, too. More importantly, these ideas work to grow both the school and the park rather than pit the two against each other. Vote no on Measure I, and let’s get our city leaders to think of a more innovative solution that works well for both San Diego High and Balboa Park. Howard Blackson is a principle designer with Michael Baker International and an adjunct instructor at the NewSchool of Architecture + Design. Michael Stepner is a professor of architecture and urban design at the NewSchool of Architecture + Design. Their commentary has been edited for style and clarity. See anything in there we should fact check? Tell us what to check out here.